John Stoddart was the tenant of Williamhope farm. He was a supporter of the Covenant and although he was hunted down, he survived the Killing Times, dying on 15 July 1692 aged 67. His brother, William Stoddart, was also a Covenanter and had to leave home to hide in the open countryside. It is reckoned that he died somewhere on the hills. 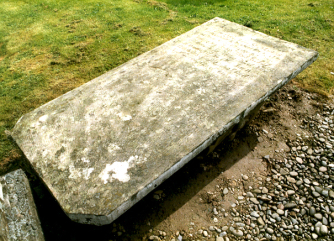 Stoddart's gravestone is an old tablestone, located near tot he door at the south-eastern corne rof the church. The SCMA financed the cleaning of the stone.